Which to Get First, Incorporation or Employer ID? As you start your new business, two important first tasks are incorporating the business (registering it with your state) and filling out an Employer ID application. These two tasks must be done immediately but they can be done in either order, presenting one of those "chicken and egg" situations. Which must be done first? It depends on your business checking account. Most businesses need an Employer ID Number (the tax ID for a business). To get this number, you must submit Form SS-4, either online or by fax or over the phone. You'll need to know the name of the business, the address (you can change this later), and the legal type. You can file the EIN first, before you set up the legal type, as long as you don't wait too long to do this. Your business almost always will need a business checking account. It is probably the first thing you will need, in order to pay for the registration with your state. But, unfortunately, most banks require you to have an EIN for your business before you open a business checking account. Yes, that's the same bank where you would set up your business checking. 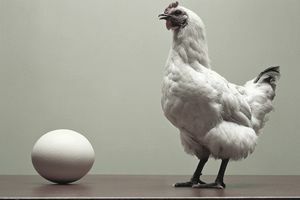 How do you get around the chicken-and-egg dilemma of business checking and business registration? The easiest way is to use your personal checking account to fund the business registration with your state. Then make an accounting entry to transfer this cost to your business. Here's how: Let's say your state registration amount is $50. You have written a check from your personal checking account to pay this amount. When you get your business accounting set up, have your accountant create a journal entry to show a capital contribution of $50 from you (the business owner) to your business. Don't let the bank talk you into a "self-employed" business checking account that you start then close after you have your tax ID number and state registration. It gets way too confusing on this. The easiest way to get started in a new business is just to get the local licenses and permits and start a sole proprietorship. If you are just forming a sole proprietor business, and you aren't registering your business with your state, you can set up this "self-employed" business. If you don't have employees, you also don't need an EIN (you'll use your social security number). To incorporate a business or form an LLC, you will need to register your business with your state. You will need to know the name of the Registered Agent (the person responsible for sending/receiving official documents) and this person must have a physical address (not a PO Box) in that state (you can be the registered agent). If your company will sell stock, you will also need to know how many shares of stock there will be initially, and some other information. You will also be required to pay for the incorporation application when you send it in or apply online. If you don't have a business checking account you'll have to use a personal checking account or credit card and get reimbursed. You will need the same information for both the EIN application and the Articles of Incorporation. It may be good to do the EIN first, then get a business bank account set up, and use your first check or credit card to pay for the incorporation fee. Check with your attorney or legal advisor before making any decisions about official filings, since these are irrevocable.